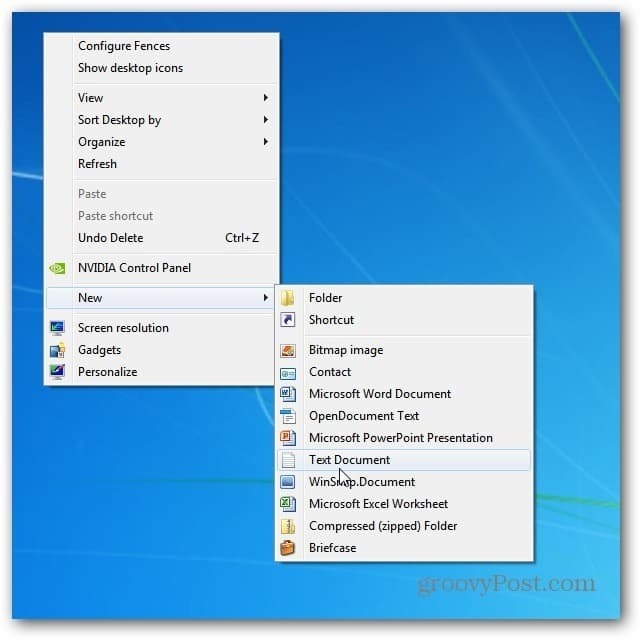 First, right click an empty area on your desktop and select New >> Text File. Now name that text file to something memorable .exe. Here I naming my external drive that I use for Plex Media Center which has a lot of videos, songs and pictures to MediaDrive.exe. It’s important to change the file extension from .txt to .exe. Click Yes to the dialog that asks if you’re sure you want to rename the file extension. Now, pin the file you just created to the Taskbar. 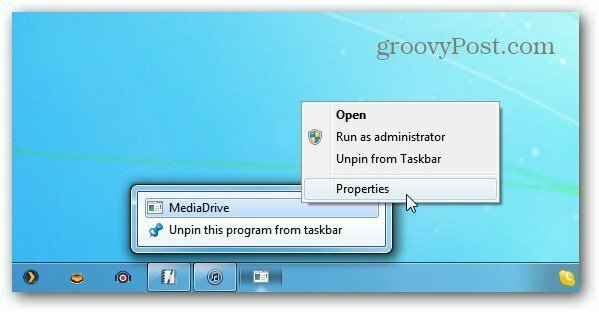 Now that the file is pinned to the Taskbar, right click on it, then right click its name from the menu and select Properties. The Drive Properties screen comes up. Select the Shortcut tab, and enter in the Target and Start in Fields for the drive you selected. For example, the drive I am using I named (Z:) which I entered in the Target field. If you’re using a drive that shows up in Computer, in the Start In field type: %users%\drive:\ – where Drive is the letter of the drive you want to open. While you’re in the Properties windows, you might as well click Change Icon too. Then select an icon you want to use. Here I selected a hard drive icon. Click OK in both screens, then you’ll see your new drive icon on the Taskbar. Thanks for the tutorial Brian, its something Ive been trying to do for a long while. @Alan Wade: You’re welcome! We try to cover as many angles of tech as possible. More on the way! Thanks for reading. I can set it up OK, but I can’t get the icon to change on the task bar. It changes in the properties, but not on the task bar. Works well, though I had to make the file extensions visible through the control panel. In addition the icon change (own Icon set) required a hard reboot to show up on the task bar, otherwise a great hack – Thanks a lot Brian. 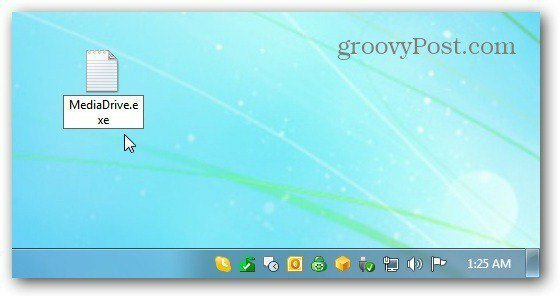 Very Nice post… will it not work in WinXP? I created a .txt file to .exe file in WinXP but it doesnt turned to Shell file. It remained as Notepad only. How that .exe file turned to shell file in Win7 but not in WinXP? Press the “Windows” key and “E” together to open Windows Explorer. 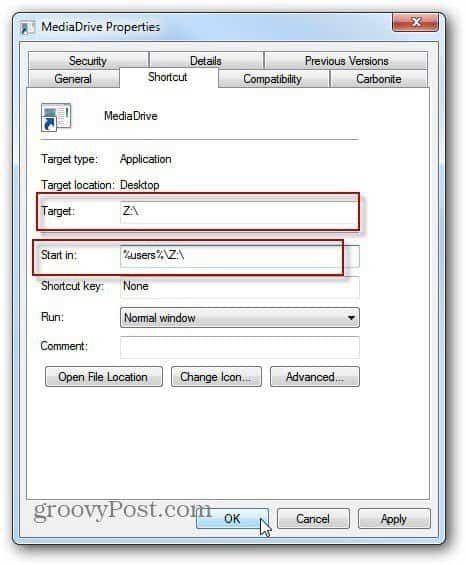 Right-click the drive and select “Create Shortcut”. Windows will create a shortcut icon for the drive. Left-click the icon, hold down the left mouse button and drag the shortcut to the “Start” button at the bottom of the screen. Release the mouse button. XP will pin the folder shortcut to the Start menu. I did following work around – right click on taskbar -> click toolbar->select new toolbar -> select and click OK. But I want to see as the requirement mentioned in this post.